My sweet bear that my sister gave me almost 27 years ago is hosting the tea today. The napkin that I made came from some fabric that I kept from a pillow I had made years ago. It's hard for me to part with scraps of pretty fabric. The roses came from Target and for $5.00 I was able to get three vases full of roses. Today I'm having some Black Forest Cupcake tea, another yummy tea from Margie, at Tea In The Valley. This is my favorite, Margie!! This Royal Albert Polka Rose teacup is one of five from a set, that I received from my youngest son and daughter-in-law for Christmas. Aren't the roses so pretty inside the rim of the cup? There's also one in the bottom of the teacup. Here is the set of teacups in a hatbox from Royal Albert, "Celebrating 100 years of English Craftsmanship". Aren't they beautiful? I added a string of pearls to my bear for the occasion. Can you see her rosy checks? She's held up well for 27 years, don't you think? In a small bowl, combine flour, almonds, and cinnamon. In large bowl, beat butter and sugar with electric mixer until light and fluffy. Add egg and vanilla; mix well. Add flour mixture, mix only until incorporated. Divide dough into two pieces; press into discs, about 1-inch thick. Wrap separately in plastic wrap and refrigerate for two hours or until firm. Preheat oven to 350 degrees. On floured, roll out one disc to 1/8" thick (keep remaining dough chilled.) Cut half of the dough with the chosen insert (this is the top cookie); cut an equal number of rounds with the cutter without the insert (this is the bottom cookie). Transfer to parchment-lined baking sheets. Dough scraps can be formed into a disc, chilled for at least 30 minutes and rerolled. Bake for 10-12 minutes or until light golden brown. Cool on cookie sheet for 2 minutes; remove from sheet and cool completely. Invert bottom cookies, spread with about a teaspoon of jam. Dust the top cookie with confectioner's sugar, and gently sandwich cookies together. (Oops, I dusted the top with the jam!). Recipe says that it makes about 20 cookies, but I got about 32 cookies. Tea Cup Tuesday I was featured! Those cookies looks so good and pretty too! Amazing your teddy bear looks new after 27 years, so sweet! What a beautiful gift assortment of teacups Kitty! Your linzer cookies are perfect for a February tea and I love your sweet bear along with your button pillow too! Black Forest Cupcake tea! What a delicious treat! Your cookies look like they came from a bakery Kitty, and your tea cup collection is endless. Love the polka dots! I love your Celebration teacup...what a wonderful gift for you! I have always loved Linzer cookies...but only if someone else makes them! Lol! Too fiddly and time consuming for me at this point in my life. I am so impressed! Thanks so much for linking to Tuesday Cuppa Tea! Your bear is adorable, Kitty! I bought a linzer cookie cutter several years ago, but have never used it...sugar cookies are my favorite cookies, but the least favorite to make. Beautiful tea cup set. Kitty, what a sweet post! 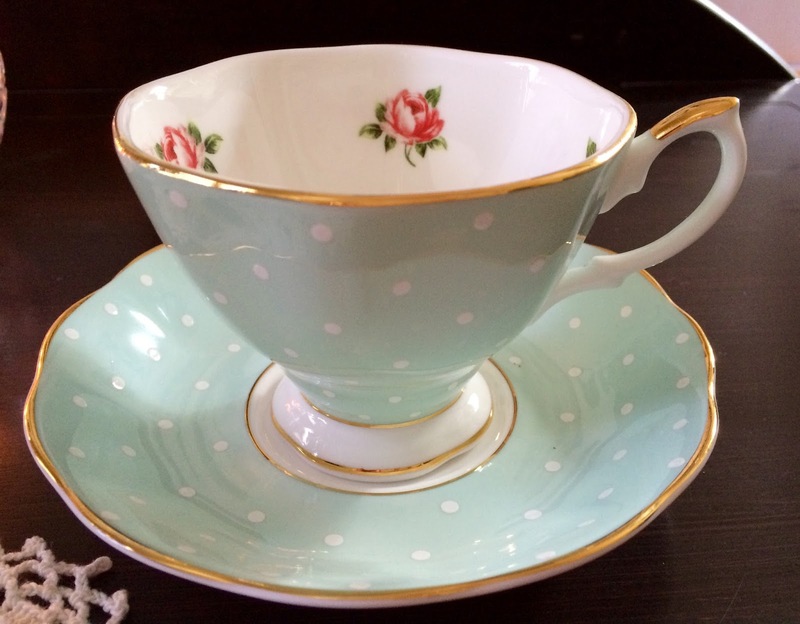 I'm crazy about teacups and yours are all simply beautiful! That recipe, oh my, delicious, I know it! Your cookies are so pretty, Kitty. I have always wanted to make them but never did. They sound easy enough and the raspberry jam would be delicious. I love your teacup! It's one of my favourite patterns in the new RA patterns. Darling bear too! Thank you for sharing with us and have a lovely day. I love liner cookies! They are so good! If you're going to both Charleston and Savannah, I definitely would recommend visiting the Charleston Tea Plantation which is between them. And take the tour. I learned so much. We did have lunch at a tea room in Savannah run by SCAD. Cute place, great food. We did not have tea anywhere, however. Now it's my turn to swoon over your RA beauties, Kitty! My favourite is the aqua teacup with white polka dots. Your sweet bear looks adorable! My much loved stuffed toy from childhood just passed the quarter century mark and has undergone many "surgeries" over the years. Heh. My mother adored Linzer cookies. I also love them. Your bear looks brand new. Hi Kitty, I just love your sweet little bear from your sister. It is so special and what a darling little face. Love your tea cup. The color and the delicate design is so pretty. 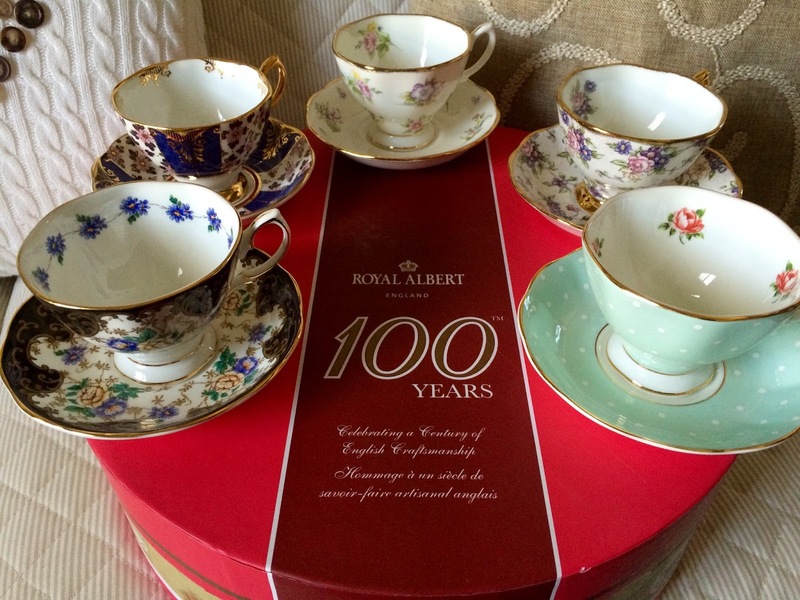 How special to have a nice collection from an anniversary set of Royal Albert. Such a wonderful gift from your children. Oh how delicious the cookies look. So thoughtful of Debbie to send you the cookie cutter. The recipe sounds like a good one. They look delicate and mouth melting. Thank you for sharing your tea with us today. Enjoy our warm weather. We may get cold again. It's only February but I think we are in for an early spring. Let's hope!! How precious your little bear looks in her pearls! The teacup is so beautiful & I can't wait to see the others in the collection...such a thoughtful gift. Thank you for the recipe for the Linzer cookies. I've never made them but I've eaten my fair share. I love these cookies ~ one of my favorites!! Such a thoughtful gift and you certainly made beautiful cookies. I so wish we were neighbors! The tea cup and saucer are just gorgeous and I can't wait to see all of them. Your little bear is adorable and I'd say she's aging quite nicely. The roses, napkin...everything is perfect! Dearest Kitty~ what a precious tea party, and your darling bear is quite the compliment sitting there so pretty. She has aged very well, but I would have to say that she is under the perfect love and care in your home. I once owned a bear very similar to yours but gave her a new home for someone else to love. I am admiring your gorgeous tea cups! 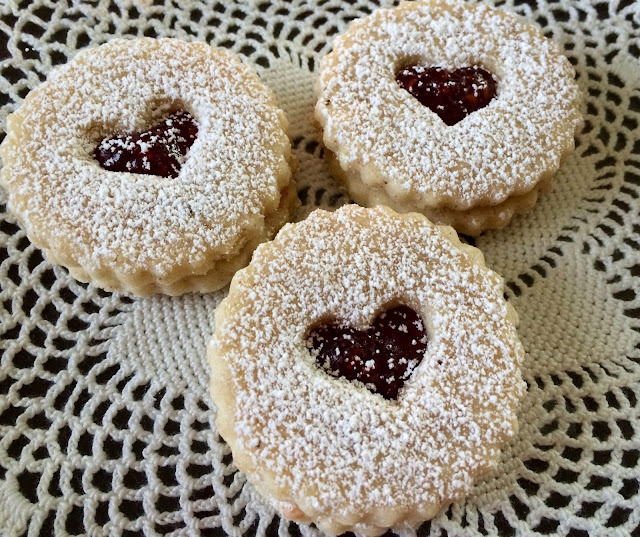 What a delight to hear that you are enjoying your linzer cookie cutter. I was so pleased to see your post in my in box and how blessed I was to come for visit and see your loveliness while I'm away on a break. I have been thinking of you. Kitty, what a sweet tea party! Love the bear and the teacups. And those cookies are something I must make very soon! Beautiful Royal Albert teacups, they make some lovely pieces. Your Lady Bear is looking cute as well. 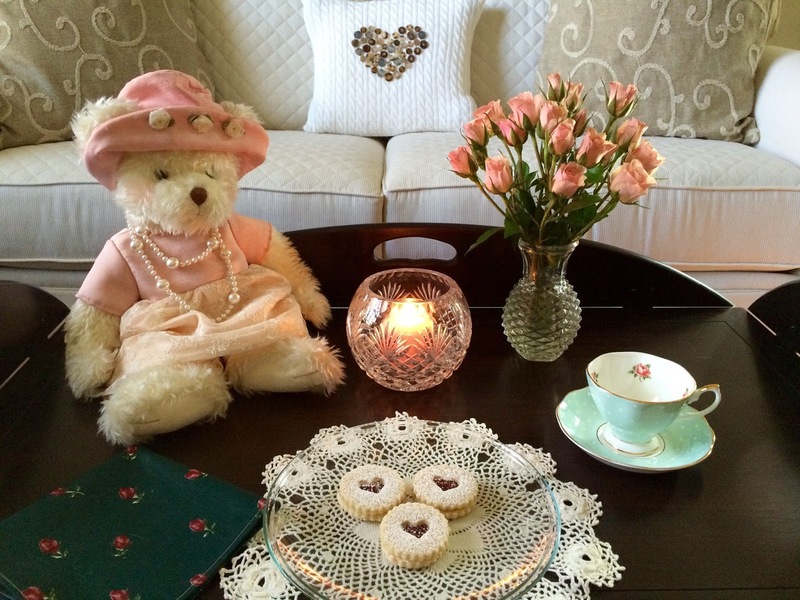 Miss Bear is looking quite elegant and ready to enjoy a tea party!I'm in awe after seeing your RA teacup set. What an amazing and thoughtful gift! Each teacup is such a treasure. I've always been a bit apprehensive about making Linzer cookies. I should give it a try. Your heart cut out is so sweet and perfect for Valentine's Day. And now...your tea cups, dear Kitty...they are too exquisite for words, particularly the one you had tea from today! The colour...the design...the shape...beautiful! With much dear love and a hug to you, dear Kitty! Thank you so very much for sharing this precious and extra special post with Roses of Inspiration. Love to you! Oh kitty those cups are absolutely beautiful!!! What a lovely gift! And yes your bear has aged well! Very charming indeed. Thank you for posting the recipe those cookies look delicious! Everything looks wonderful, and I too have a hard time parting with pretty fabric. Sweet bear tea! I love your new set of tea cups. I saw that set in Southapmton England a while back and was trying to figure out how I could pack it in my luggage! lol. I left without. But you here have been gifted the set! Yay! What a thoughtful gift for you. Those are my favorite cookies! Yum! I think they are perfect for tea. Hi Kitty, love your cookies! Yum! How nice to receive all those lovely RA teacups for Christmas. I love Royal Albert. A girl can never have too many teacups or teddy bears! Happy Tea Day! Kitty, those cookies look so professional! Like they came out of a specialty bakery! And I love your teacups. I have the Polka Rose one, love the colors, and it's so charming. A few years ago, Victoria magazine did a story on these RA teacups representing decades of the 20th century. I think the Polka Rose was from the 30s. 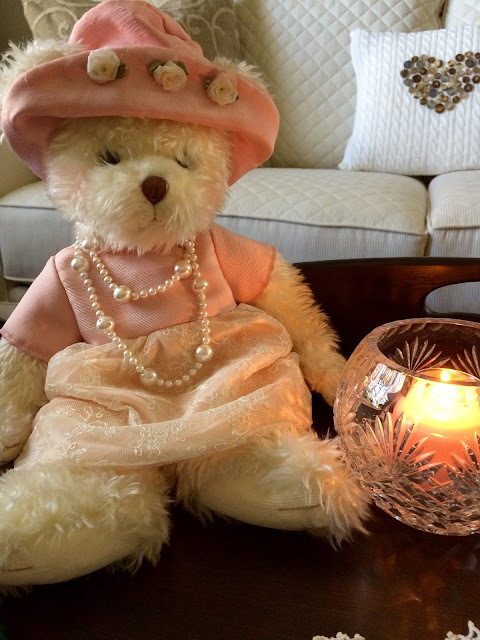 And how nice that your bear was able to wear pearls for the occasion :) Love her rosy cheeks. The roses are lovely and the bear is so cute with them, yes she looks great for her age. Like the doily under your plate, great table setting all around! Oh my, those cookies look so yummy! And boy, that polka dot tea cup just made my heart leap!! Sweet bear and fun to know about Stephanie's mom. So glad you'll be sharing this with SYC. The cookies sure look yummy, what a fun post. The bear is adorable! The cookies look delicious and the tea cups are amazing! My bears are so envious of your tea party and said I need to help them host a tea party. Love your special bear from your sister, sister gifts are precious. The tea cup is lovely with its color and roses inside. Hope all is good with you and yours Kitty………. Kitty, the cookies are too pretty to eat! I love a sweet tea time, and you do it perfectly. Your teddy is adorable. Love her pearls! I am having fun seeing the set of teacups as a DeJaVeu - I used to sell those. They are very pretty and I am loving at darling bear. Your cookie recipe is wonderful. Kitty, we closed on our house in Missouri and Friday and now we live in 2 houses. We go back tomorrow to pack the rest of the stuff! Work, work, and work. I am actually responding to those who linked right now at the grocery store!!! Take care! These are so pretty! They are the perfect little cookie to have with a cup of tea. Pinning! Your teacups are so pretty Kitty. I love how beautiful your cookies look too! What a cute teddy bear dressed for tea. The cups AND cookies are gorgeous!! So lovely. Your bear is so pretty..just as sweet as can be...love the teacups..a beautiful set. Looking at your photos, I am wondering if your sofa is white or gray..? You sure have some pretty pillows on it. My hubby gave me a Linzer cookie-cutter set for Christmas several years ago, and I still haven't used it. Yours are so pretty, they've given me some inspiration. Just right for a Valentine's tea. I hope you have a great weekend, Kitty!! Linzer cookies are some of my favorites. Not only are they delicious, they are so pretty. Your recipe is nearly identical to mine. I should call my daughter and ask her to bake up a batch. They used to be her signature cookie. I rather miss them. all...it's fantastic..... very good, very nice! Your cookies look wonderful! Thank you so much for sharing with us for our 5th Anniversary of Full Plate Thursday! Hope you have a fantastic week and hope to see you again real soon! Your bear has aged well Kitty and a welcome guest to your tea party this week. Hi sweet friend! 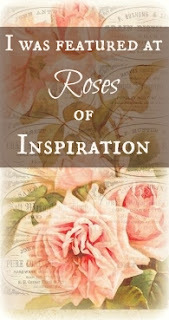 I wanted to let you know that this lovely post will be featured at Roses of Inspiration tomorrow. Thanks for sharing :) Hugs and love to you! Kitty I had to come right over to visit because your cookies are some of the best I have EVER had. Alyssa and I both polished them off on the car ride home. Thank you so much for the recipe. I loved your latest post that showcased your darling sweetheart. Have a wonderful day! These look beautiful! I just saw Janet's cookies and your comment that said you had made them too! So I figured I must have missed some of your posts so now I am backtracking!!! So many pretty teacups! That polka rose teacup caught my eye!!! I saw photos of your lovely luncheon! How I wish I loved nearer to you all! Looks like a wonderful time! Happy Valentine's Day Kitty!